As we pulled up to the gate at Walter Reed National Military Medical Center, my mind began to trace back in time to December 2006 when my family found out that my sister would be transported back there from Iraq. She had left months before, armed with her Arabic language skills, her ability to fly Black Hawks and her strong patriotic spirit. 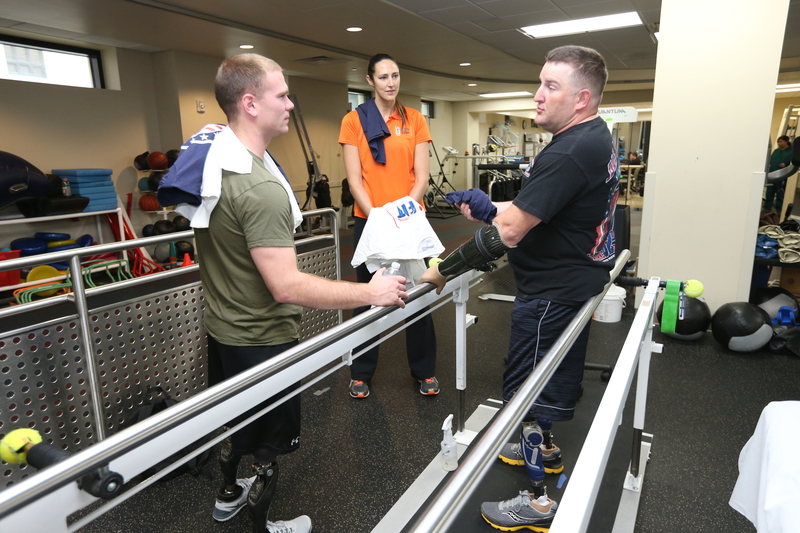 Walking through the rehabilitation facility, I had an opportunity to meet a lot of amazing men and women who shared my sister’s same unwavering devotion to this great nation. Patriotism like theirs is hard to describe, it is a belief that goes beyond words. It is a commitment and conviction that not only invokes action by every fabric of their being, but it is a mindset that acknowledges that very action is also accompanied by a willing sacrifice. David Robinson, Buck Williams and I walked through the facility as representatives of our Hoops for Troops initiative that was designed to show the NBA and WNBA’s gratitude to our armed forces for their service to our country. 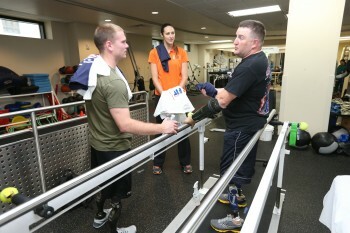 Many of the soldiers were in there working with their trainers to develop the strength and balance needed to walk and eventually run again on their new prosthetic legs. I met an amazing young man who lost his hand, but due to advances in technology was able to still unassemble and reassemble his weapon for us in remarkable time with the help of a prosthesis!! Our entourage traveled from Walter Reed to Quantico Marine Corps Base, were I had the opportunity to hear former NBA Official Bob Delany deliver a powerful message to some of the soldiers about his personal experiences with PTSD, Post Traumatic Stress Disorder. Trauma is not a popular topic in our society, and especially not among the strong defenders of our nation. Bob talked about a healthy way to deal with PTSD, by becoming knowledgeable about it and by discussing it in a safe environment amongst peers, so the detrimental effects of silencing and suppressing those emotions no longer have power to breakdown our brigades! By the end of the day, I was filled with such mixed emotions. I sympathized with the families, who like mine, would spend the following months and years trying to help their loved ones heal and re-acclimate to civilian life or if they chose to stay in, they would be supporting them as they processed through serving in a different capacity than they were used to. I also felt guilty for the times when I have personally and when our society as a whole has taken for granted the freedoms we enjoy in this great nation. Lastly, the images of the wounded warriors we visited evoked an overwhelming sense of appreciation, the kind that gets you choked up once you realize you have been given an extraordinary and very costly gift that you can never repay. So from the depths of my soul, I extend my gratitude to all those who have and are currently serving and to their families. I am very proud that the NBA and WNBA are equally as passionate about extending their gratefulness as well!! God Bless the U.S.A.!! This entry was written by RuthRiley, posted on November 15, 2013 at 10:03 am, and filed under Uncategorized.